The Portage Lakes Disc Golf Association is a new organization which has constructed an 18 hole course in Portage Lakes State Park. The course is now open for participation by beginners and champions alike. It's an easy sport to play, difficult to master. 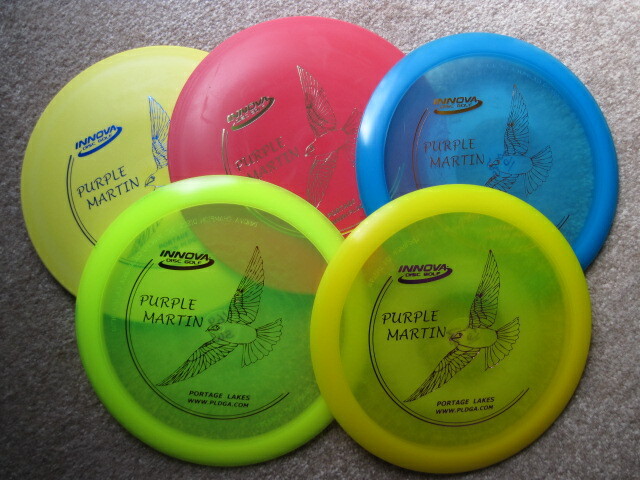 However, you can look like a real pro if you use one of the specially designed, collectible, Purple Martin discs shown below. There are two types on sale, the Sidewinder and the Wedge, at a cost of $15 and $10. The association also has attractive numbered bag tags for competition.